Fleetwood Town defender Cian Bolger admits the club is embarking on a ‘massive’ period of fixtures as they head to fellow strugglers Doncaster Rovers this afternoon. The centre-half is available for Uwe Rosler’s side following the completion of a two-match suspension. His return would boost a Town side who travel to the Keepmoat Stadium on the back of four straight league defeats and six in all competitions. The most recent was Tuesday’s loss against Shrewsbury Town; a match in which Bolger would have figured had his suspension not been carried over as a result of last Saturday’s call-off at Rochdale. “It’s easier when you play; you feel you can help the lads out but it’s difficult when you’re watching,” he said. “There is a lot of disappointment but also a lot of positives to take as well. “In the last four games we have played quite well but are conceding late goals. Town’s poor run of results has seen them drop to 18th in League One, two points clear of the bottom four. They face a Rovers side two places and three points above them, knowing victory would be the ideal build-up for consecutive home games. 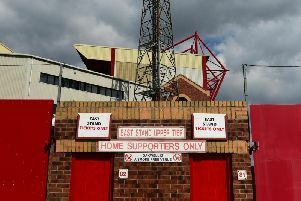 Play-off chasers Portsmouth visit Highbury on Tuesday before third-bottom MK Dons are the opponents this time next week. Town shared the spoils with today’s hosts following a goalless draw earlier in the season and Bolger expects a similarly close encounter. “It was a 50-50 game the last time we played them and I don’t think there will be much in the game,” he said. “We have to be bang on it and, hopefully, we can get something from it.